Top officials of the U.S. 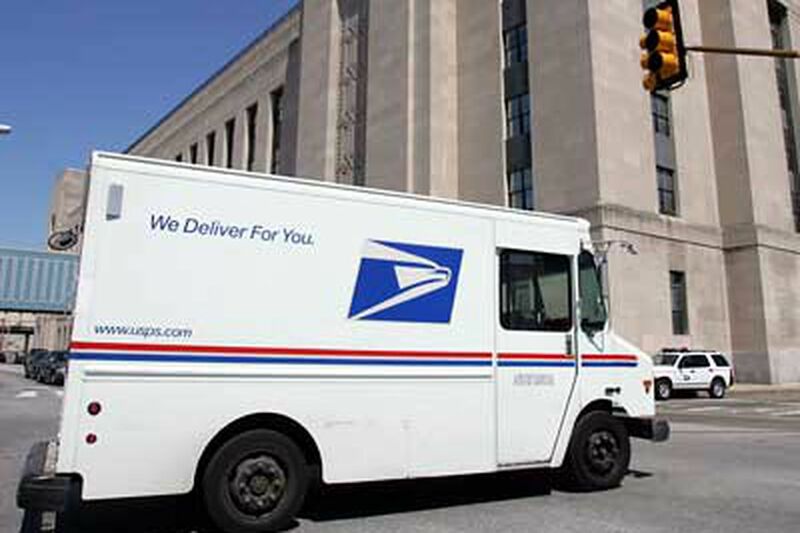 Postal Service and the American Postal Workers Union are monitoring the serious mail problems in Philadelphia. But William Burrus, national president of the APWU, warned of an even worse problem on the horizon than "just the delay of the mail." With a nearly $3 billion loss in fiscal '08, and a projected deficit of up to $5 billion in the current year, the USPS is "close to not being able to sustain a national postal-service system to the public," Burrus said. "I would not use a word as strong as 'insolvent,' " he said. "But they are in enormous debt. They are in very, very, bad circumstances. "If they continue on a downward trajectory, it may happen sooner rather than later," he added. Burrus described the problem as operating "first-class service on fifth-class revenue." "We have had a significant loss of mail volume," said the top union leader, referring to 9 billion fewer pieces of mail processed this year and a 15 percent drop in November and December. "They are under tremendous pressure to cut down costs . . . and they are squeezing employees," he added. Nevertheless, Burrus said that U.S. Postmaster General and CEO John F. "Jack" Potter was aware of recent problems at the Philadelphia U.S. Postal Service's Processing and Distribution Center. "It's been placed on his radar screen and he's attempting to address it," said Burrus. Burrus was alluding to the delayed, missing, destroyed and allegedly undercounted mail discovered recently at the Philadelphia processing plant in Southwest Philadelphia, which was similar to problems unearthed in Chicago two years ago. USPS spokesman Gerald McKiernan said that Potter's remarks made to union leaders recently were off the record. He pointed out that Jim Gallagher, the acting regional manager, had taken over in Philadelphia and that the Daily News had interviewed him recently. McKiernan said that Potter was not available for comment, explaining: "This is the busiest time of year." Regarding Philadelphia's mail problems, Burrus said: "I defend the APWU president [Gwen Ivey] and her efforts to preserve the number of jobs to preserve the service to those communities. "I would not expect my president in my Philadelphia local, where . . . people could be losing their jobs, to do anything else," he added. Asked about allegations that senior managers were ordering clerks to undercount the mail and directing mail to be delayed, or color codes changed so that mail would not appear to be late, Burrus replied: "I'm not endorsing every supervisor or manager. "I'd not be surprised if this occurred in good times or bad," he added. But Burrus said that he did not believe that managers and supervisors were trying to get rich through bonuses "at the public's expense." "Management has their own internal processes to deal with supervisors of low character or morals," he said. "The post office is affected by the habits of the public," he added. "Because we are in a severe economic slump, mail volume is down. It goes up and down with the nation's economy. "I have told my compatriots that I no longer blame e-mail and the Internet on decreasing the mail volume," he said. Mail volume should be increasing, said Burrus. Only four percent is citizen-to-citizen communication; 55 percent is advertisements and 45 percent is business-to-consumer and consumer-to-business. "There are no commercial transactions that feed into mail volume now," he said. "Few commercial entities are soliciting. You're not getting as many credit-card solicitations, or offers to cruise the Bahamas. That volume is all down. "We can't look back," said Burrus. "Things have changed and adjusted. Now, people are not writing anything. "Urge the public to mail a letter to a loved one and do it weekly," he said. "That would help." Like many others, Burrus, pins his hopes on President-elect Barack Obama.